Lawmakers from both parties cautioned the Veterans Affairs Department to tread carefully in enacting a law President Trump signed last year to give more veterans access to private sector health care, suggesting the current trajectory could sabotage the entire program. VA is actively seeking to address potential pitfalls through its negotiations with potential contractors that will make up the “community care network,” Secretary Robert Wilkie told a joint, bicameral congressional committee on Wednesday. Criticisms came from an array of sources, most of whom voted to approve the MISSION Act last year. 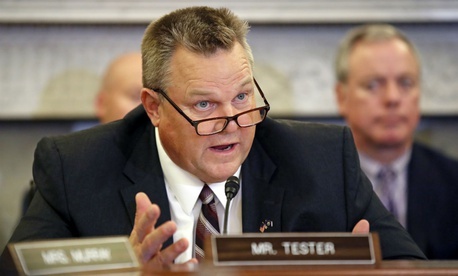 Sen. Jon Tester, D-Mont., the top Democrat on the Senate Veterans Affairs Committee and a cosponsor of the MISSION Act, said he has “grown increasingly concerned” about the law since it sailed through Congress last year. He accused VA of going down a “different road” than it was just six months ago with regard to its implementation. He suggested VA is now considering a complete outsourcing of certain procedures and appointments, as well as giving veterans carte blanche to pursue private care outside of VA based on “arbitrary” wait times or distance from a VA facility. One of the main tenets of the new law was to move away from such metrics for determining eligibility for outside care, Tester said. Wilkie said the department, in conjunction with the White House, is in the process of determining its “designated access standards,” or the criteria it will use to decide which veterans have access to the private sector through the MISSION Act. Trump is planning to unveil those criteria in his State of the Union address, lawmakers said at the hearing. Wilkie committed only to briefing lawmakers on the criteria as soon as the president approves them. He conceded that veterans are “not chomping at the bit” to increase their access to private care and are generally happy with VA services. He noted that the use of community care has actually dipped slightly in recent years and very few veterans eligible to have 100 percent of their private sector medical costs paid for by VA choose to pursue that path. The MISSION Act provides veterans with access to private sector care when the services they are seeking are not offered at VA, there is no full-service medical facility in their state, they previously were eligible for outside care under the Veterans Choice Program or VA cannot meet its own standards of care in providing care to an individual veteran. It also allows a veteran and doctor to mutually agree that private care was in the patient's “best medical interest.” It no longer requires veterans to live more 40 miles from a VA facility to get private care. The law will soon sunset and replace the Choice Program, which Congress established after the 2014 scandal involving department employees manipulating patient data to hide long wait times. The existing program is set to expire in June, one year from the date Trump signed the MISSION Act into law. Rep. Phil Roe, the House VA Chairman and the MISSION Act’s main shepherd in the lower chamber, said he did not want to repeat the “fiasco” of the 2014 law’s rollout. Tester said the onus was now on Wilkie to ensure such a fate does not befall the new measure, which consolidates existing community care programs. Lawmakers repeatedly pointed a recent report that found the Choice Program was riddled by unusually large overhead costs and overcharging by the contractors tasked with implementing it. Wilkie admitted the costs were a problem, saying VA was “taken advantage of” due to a rushed time frame associated with 2014 law and decisions were made before his tenure. “VA had to move as rapidly as possible and there was not that time for reflection that you would usually have for an issue like this,” Wilkie said. He sought to assuage concerns by saying the MISSION Act addressed the problems created by the 2014 law. Ongoing negotiations will ensure new contracts reduce overhead costs, he said, though lawmakers noted one of the contractors, TriWest, is still operating on the existing contract. Rep. Jim Banks, R-Ind., suggested VA may be sending good money after bad. “It seems like we've been pouring money into a leaky bucket or a clogged-up pipe,” Rep. Jim Banks, R-Ind., said. The secretary said VA expects three of the four regions of community networks to have all the contracts in place by the end of February 2019, with contracts for the fourth region established the following month. The program is set to “go live” in June. Wilkie also took the opportunity to praise the VA workforce. “This may come as a surprise to some in the press that a conservative Republican would say this: I am incredibly proud to be part of the best workforce in the federal government,” the secretary said.